 A classic Reuben Sandwich (photo J. Java |Fotolia). A Reuben on marble rye (photo courtesy Boar’s Head). 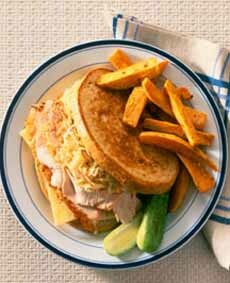 A Turkey Reuben on plain rye instead of pumpernickel (photo National Turkey Federation). 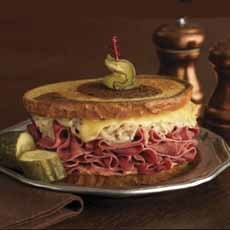 In 2013, March 14th was declared National Reuben Sandwich Day by the city of Omaha, birthplace of the Reuben Sandwich. As the story goes, Reuben Kulakofsky (1873-1960), a Jewish Lithuanian-born wholesale grocer, invented the sandwich in the late 1920s for his weekly poker game. He may have had input from members of the group, which held forth in the Blackstone Hotel from about 1920 through 1935. The Reuben he created is a grilled or toasted sandwich on rye or pumpernickel, with generous amounts of corned beef, sauerkraut, Swiss cheese and either Russian or Thousand Island dressing (the difference is the pickle relish in the latter). Among the poker players was the hotel’s owner, Charles Schimmel, who added it to the Blackstone’s lunch menu, where it was quite popular. 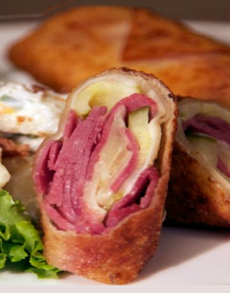 But the Reuben Sandwich became known nationally when a hotel employee won a national contest with the recipe. The National Sandwich Idea Contest was a promotion held during National Sandwich Month, to inspire professional cooks to create excitement in the sandwich category. It was sponsored by the Chicago-based Wheat Flour Institute. The first winners were announced in 1956, and top honors went to Fern Snider, a cook at the Blackstone [source]. The sandwich recipe was provided (restaurant sized, for 48 sandwiches!) to restaurants nationwide. Another story credits Arnold Reuben (1883-1970), the German-Jewish owner of the Reuben’s Delicatessen in New York City (open 1908 to 2001, changing locations numerous times). In a 1938 interview with Arnold Manoff, a writer with the Federal Writers’ Project of the WPA, Arnold Reuben details his creation of the “Reuben Special,” but it was made with roast beef, not corned beef, in 1926 [source—a seven-page transcript of the interview]. He also claims, in that interview, to have created the concept of sandwiches named for celebrities. That claim is not contested. The evidence says Omaha wins. 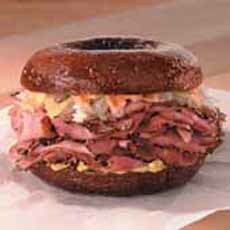 But it took until March 2013, in Omaha, for the mayor to proclaim March 14th as Reuben Sandwich Day. Check out our Sandwich Glossary for other sandwich histories. 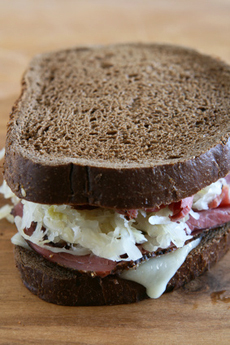 The Reuben has been adapted many times over, including a substitute of pastrami, turkey (photo #2) or tongue for the corned beef, and coleslaw for the sauerkraut. Rye or marble rye (photo #2) can stand in for the pumpernickel. Georgia Reuben: a Michigan variant of a turkey Reuben that substitutes barbecue sauce or French dressing for the Russian/Thousand Island dressing. Grouper Reuben: a Florida specialty that substitutes local grouper for the corned beef. Lobster Reuben: this Florida Keys variation substitutes lobster for the corned beef. Montreal Reuben: substitutes Montreal-style smoked meat for corned beef. Walleye Reuben: a Minnesota version that features the state fish, the walleye, instead of corned beef. West Coast Reuben: substitutes Dijon mustard for the Thousand Island dressing. 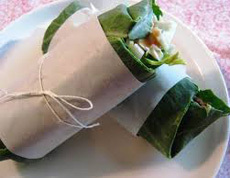 We’ve also published recipes for Reuben Egg Rolls (photo #5) and Reuben Collard Wraps (photo #6). A Reuben on a pumpkernickel bagel (photo #7). Oy vey! A pumpernickel wrap sandwich is a much better homage (they’re made by Tumaro’s and can be found nationwide, including at Walmart). This year we have Reuben Biscuits (photo #3). The recipe follows. Thanks to King Arthur Flour for this variation (photo #4). Prep time is 15-20 minutes, bake time is 22-24 minutes. The muffins are delicious with scrambled eggs. 1. PREHEAT the oven to 425°F. Lightly grease a baking sheet, or line it with parchment. 2. WHISK together the flour, salt, baking powder, and sugar. Work the butter into the flour until the mixture is unevenly crumbly. Mix in the cheese, ham and sauerkraut until evenly distributed. 3. WHISK together the sour cream and milk and add to the dough, stirring to combine. The dough should be sticky. Drop the dough by the 1/4-cupful onto the prepared baking sheet (a muffin scoop works well here). The biscuits can be spaced quite close together. About 1″ apart is fine. 4. BRUSH the biscuits with a bit of cream; this will help their crust brown. 5. 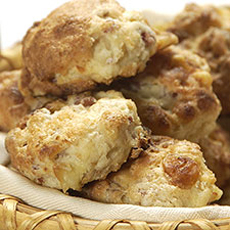 BAKE the biscuits for 22 to 24 minutes, until they’re golden brown. Remove them from the oven and cool slightly in the pan. Serve warm or at room temperature. Thousand Island dressing is a nice accompaniment.